1. Give yourself plenty of time: the first day of school is hard. The first day of school is crazy… there are so many emotions, things to pack, and new routines that all happen that day! Give yourself plenty of time to get everything done so that you don’t stress yourself out, or your kids. It especially helps if you have everything ready in advance: camera charged, empty memory card, sign printed etc. 2. 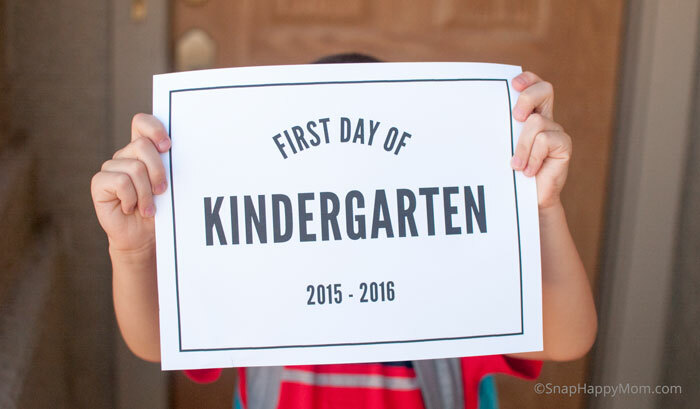 Take a “first day of school photo” with a sign at home. The first day of school sign is a fantastic tradition! 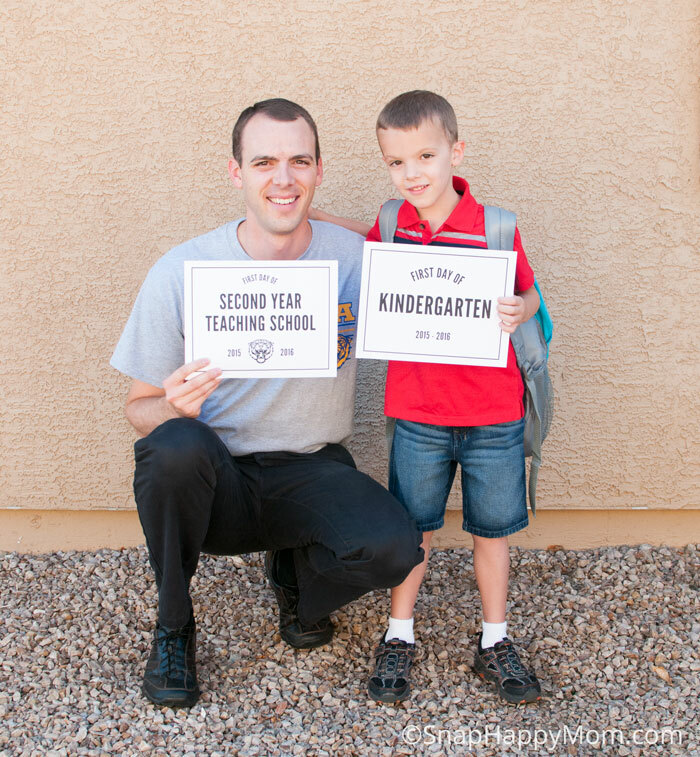 Having a sign makes total sense – it gives your child something to hold and it’s a fun reminder of which year it was. The first/last day of school signs are a fun comparison too! Get your sign printed plenty in advance: there are lots of options out there for signs. There are always cute ones on Yellow Bliss Road and Caravan Shop. This year, I wanted something really simple that wasn’t going to use all my black ink, so I just made my own. 3. Choose one photo to take at school, and save the rest for the first month. Don’t try to do a lot of pictures at the school, especially not on the first day. There’s too much stress for all parties – the kids, the parents, the teachers are all trying to run around get things done! This year I just took one of my child at their desk, and we are saving the rest of the things for throughout the first month. 4. You can skip the teacher picture on the first day! 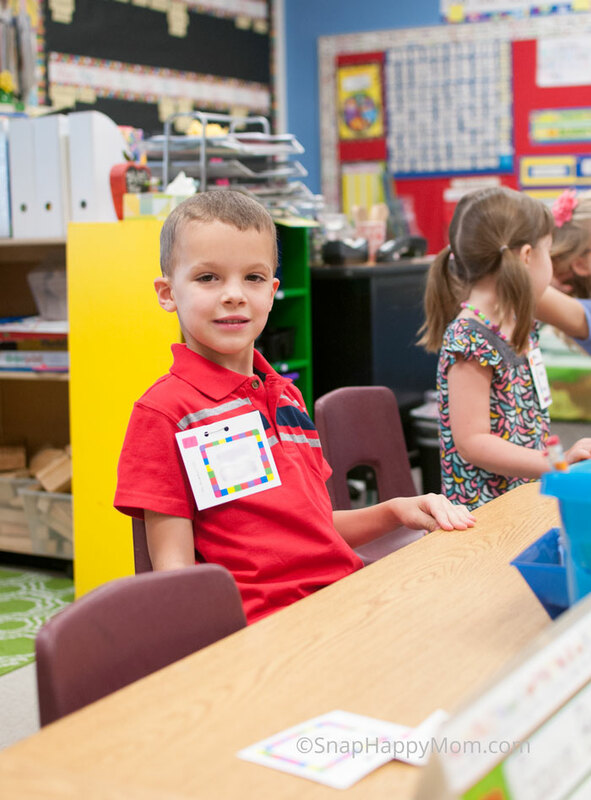 Your child’s new teacher has plenty on their mind the first day of school, and they don’t need thirty first day pictures to fill up their morning. I’ve talked to several teachers about this, and all of them agree – they prefer that you don’t ask them for a picture the morning of the first day of school! Of course, every situation is different, but you have lots of other options: you could take it at the meet & greet, the open house, the first Friday, or after school on the first day. Your child will probably feel much more comfortable with their new teacher by the end of that first week anyway. 5. Take a few after school for more relaxed smiles! This year, I snapped our sign picture at home before school started. They were fine- and certainly reflect that my little guy was indeed nervous for this new adventure. His mama’s anxiety probably played into that too! But I also took some pictures with the same sign after he came home – and there was a huge difference in his personality! 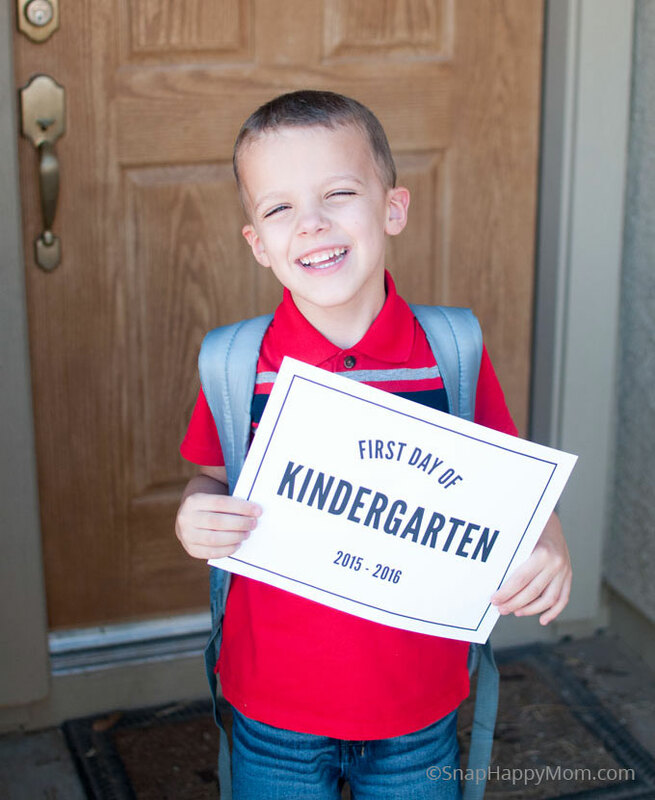 After the nerves of the first day were done, he was all smiles and giggles that school was going to be fun. So I’m giving you permission to take pictures after school. There is no photo police – no one will care or even know! So give yourself a break- you’re a lot more likely to get those real smiles after school anyway, when they can breathe a sigh of relief. 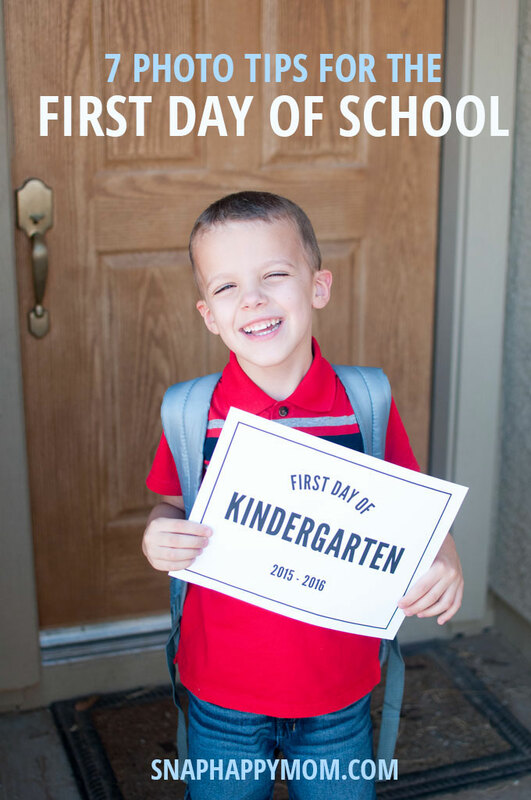 I’m glad I have both photos – to see the cheesy nervous smile before school, and the relaxed, real smile afterward. Shooting after school is a great time to get just a few more pictures of that momentous day. I try to get a close-up to really remember what they look like, in addition to a full body shot with their new backpack as well. If your kids all start school on the same day, get the sibling shot! It’s fun to see the different ages and stages everyone is in. It’s much easier to do this at home where older siblings are more likely to participate. This year, I got the first day picture with father and son- first day of kindergarten, and a second-year teaching high school. It’s a keeper! Pin it to help you not stress out!